By car traveling North on Macleod Trail: go past Glenmore Trail and (just) past 60th Avenue SW take the exit (right) at the Macleod Place entrance. 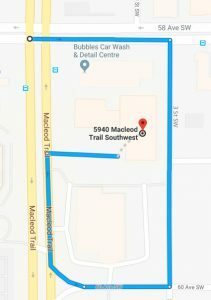 By car traveling South on Macleod Trail: turn East (left at the lights) on 58th Avenue SW. Take the first street on the right (3rd Street SW). Turn right on 60th Avenue SW. Merge onto Macleod Trail North and take the exit (right) at the Macleod Place entrance. Macleod Place Building Parking Lot (limited visitor spots out front of the building or parkade): This requires onsite registration with Impark Parking. The first hour and a half is free but payment is required for additional hours. Out front of the building: $4 for a max of 3 hours. Parkade: $8 all day (6 am – 6 pm). Other Parking: 2 hour free street parking available behind the office building located along 3rd Street. There is also limited free all-day parking along 59 Ave SW, but those spots are often taken. Due to limited parking, we highly recommend taking public transit to come to our location.